I’ve been a whole lot of mush every night as Evelyn’s first birthday comes creeping closer and closer. I’m sad at how quickly things are going but also the older she gets the more we are able to bond and play together and so that’s been really fun. Evelyn can: Walk, climb, and sign “all done,” “more,” “sleepy,” “milk,” and “eat”. She’s noticing what other people are eating and wants to try a bite. She likes to eat from an adult fork and try to get the food on it herself. She likes to drink from my water glass out of a straw and we share a morning smoothie together (it’s the only way I’ve been able to sneak in some healthy foods like avocado and spinach lately). She’ll put a toy up to her ear and walk around pretending to “talk on her cell phone” and it’s hysterical. And she’s walking and talking in one syllables (ba ba means bye bye and mo mo is more and then there’s na na which is No, all words also come with adorable hand gestures). She waves and says “Ba Ba” when someone is leaving and blows a kiss. If you’re talking on the phone and say Bye to the person she’ll pick up on it and start yelling “ba ba” and waving. She’s obsessed with stairs – going up them, coming down them. Her newest thrill is being able to walk her own dirty diaper to her diaper pail and open it, throw the diaper away and close it herself. She loves being chased around the house by my dad. She has such a sweet relationship with my parents and although she’s not a cuddly baby she always has a hug for them. If my mom is out all day on errands when she gets home Evelyn will cling to her leg and follow her around and reach out to be held and snuggled. In the mornings, she always looks at the door squawking and waving impatiently waiting for them to get up. She seems so big to me! She’s starting to look like a toddler, and while I’m sad about the baby stage almost being over, it is so much fun being able to interact and communicate more. The baby stage was so hard for me – there’s the short intervals of sleep, breastfeeding and everything that goes along with that – it felt so draining. As of two days ago we officially stopped nursing. I let Evelyn decide when she was ready to stop and now that she has eight teeth I am sooooo thankful she isn’t asking to nurse anymore. She sleeps through the night, we have her sleep trained and have gone from it taking 45 minutes to put her to bed to less than 5 minutes (yessssss). I’m currently working right now on extending her wake up time from 5:30 to 6:30 but she keeps pooping herself awake… She’s just like her Dada…. We’re also working on nap training and she’s transitioned to taking only 1 afternoon nap a day. Right now, she can settle herself back down to take a total of about 1.5 hour nap, we’re slowly working towards getting her to take a total of 2 hours. Getting this new sleep schedule has been a game changer, instead of three 30 minute naps where you could never get anything done – her sleeping later, going down earlier and taking a 1.5 hour nap in the afternoon has been bliss. The impending doom of Evelyn’s first birthday is also creeping in. I’m getting more and more emotional and couldn’t stop crying yesterday over it. How did 365 days fly by so fast?! That’s not a short amount of time. I look back at photos and I can’t even remember what it was like when she was that tiny, I don’t remember her legs being so thin. And I can see her turning into a toddler, my whole family noticed this week that her face is changing, it’s turning more oval than a round baby face. She’s this tiny human now and while it’s so fun being able to be so interactive and better able to communicate I’m so sad that this baby stage with Evelyn is ending. You only get 365 days with your baby and then that’s it. And I’m totally gutted. I got more time with her than most and it still feels like I’ve been robbed of moments and I’m trying to hold on so hard to past memories. 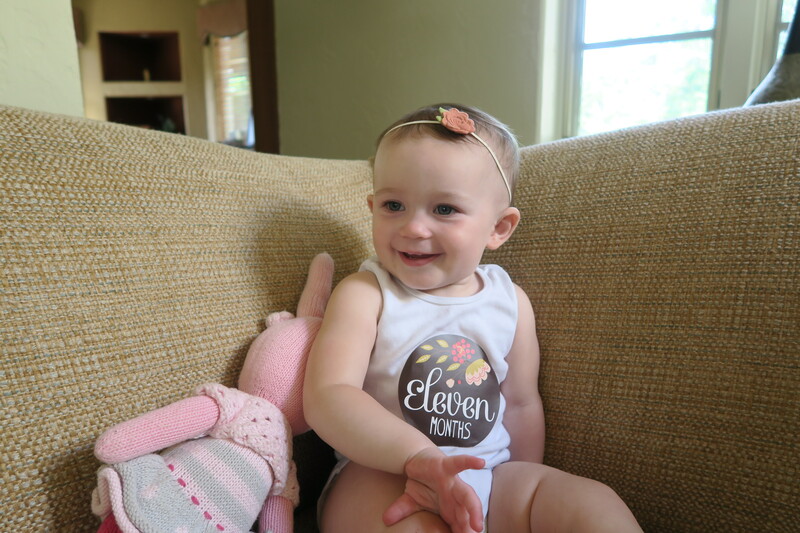 I was seriously considering canceling her first birthday party because I’m not sure I’ll be able to get through the day without being an emotional wreck. So we’re soaking in the last few weeks of babyhood. Tonight I did a test run of a dairy free smash cake recipe I saw on Pinterest, it came out great! I’ve done a ton of research on developmental toys and activities for 12-18 month olds. I bought bins and packed up all her 9 month and smaller baby clothes, my maternity clothes, all my pumping & breastfeeding accessories (miss you never Medela!) and her baby toys. Life is changing and it’s exciting and sad all at the same time.